Two 250 mm diameter semi-pneumatic grey non-marking drive wheels. Four 125 mm non-marking polyurethane castors. The Turnmate powered trolley is ideal for use in confined spaces or narrow ailes, as it pivots on the 250 mm diametre central drive wheels. It has a 400 kg capacity with a large deck with a rubber mat, making it suitable for relocating heavy items easily. 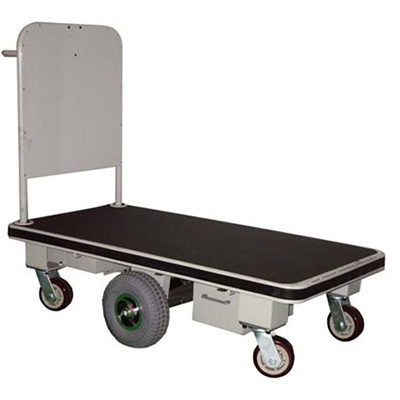 It is fitted with 250 mm diametre semi-pneumatic grey non-marking drive wheels, and 125 mm non-marking polyurethane castors, making it easy to use and manoeuvre. Load capacity of 400 kg. Six-wheeled design for load stability. 250 mm diameter central drive wheels – enabling pivoting and high manoeuverability (ideal in confined spaces).